The highly interesting fight at cruiser between Nuri Seferi (36-7) and Damir Beljo (20-0) that was set for Mostar (Bosnia & Hercegovina) September 15 is off after Beljo suffered an injury in training. The fight might be rescheduled for a date in October but it’s not certain. The undercard would have featured lightheavy Karo Murat (27-2-1) but he will be back later in the year. 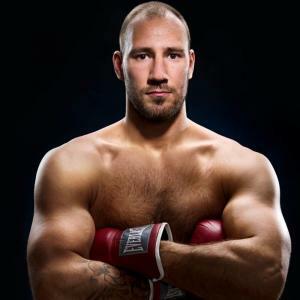 French heavyweight and WBC heavyweight contender Johann Duhaupas (32-2) will due the bulk of his preparations at home in Abbeville. The plan was first to go to Manchester and train with Tyson Fury but those plans were scrapped and Duhaupas (pictured) will train in Abbeville until September 16 before departing to the US and the fight against WBC king Deontay Wilder (34-0) September 26. As for sparring, two big Ukrainian kickboxers, Viktor Vykhryst and Dmitry Bezus, will be brought in to help Duhaupas get ready for Wilder. Duhaupas has already sparred with former WBA cruiser champ Youri Kalenga. Finnish supermiddle Niklas Rasanen (10-0) take on Welsh champ Tobias Webb (15-3-1) over ten October 3 in Kotka. Rasanen promises a very hot sauna for Webb, so hot, says Niklas, that Webb will think twice before leaving the British isles again. Trashtalk aside, Rasanen vs Webb is a solid matchup and in the chief support middleweights Paulie Klemetti (4-0) take on Timo Laine (10-5) for the vacant national title. PSP Boxteam stage a show September 6 in Wismar on the German Baltic Sea Coast. Female lightweight Nicole Wesner (10-0) defends the WBFed title against Irma Balijagaic Adler (15-5) in the headliner. The undercard features heavyweight prospects Franz Rill (10-0), Christian and Dennis Lewandowski (both 5-0) - all three promoted by Z! Promotions and PSP promoted lightheavies Nils Schmidt (6-0) and Dariusz Polmanski (7-0). 01/02/2019 - WHITE TO HEADLINE GLASGOW EVENT ON 16TH FEB.
22/09/2018 - NATHAN DECASTRO Vs AGOE ASHONG ON 29TH SEPT.
12/03/2016 - KUBRAT PULEV AGAINST "MR X"
06/11/2015 - BRISCHETTO DOESN'T SHOW UP. EBU TITLE CANCELLED! 03/11/2015 - EBU SUPER MIDDLEWEIGHT CHAMPIONSHIP: THE FIGHTERS TALK! 16/03/2015 - KO ARTIST LUCA GIACON: "I'LL BEAT STEVE JAMOYE"
25/01/2015 - MARSILI vs TATLI? 30/05/2014 - SECOND FROCH vs GROVES: WHAT IS IT ABOUT REMATCHES? 27/12/2012 - ABRAHAM vs STIEGLITZ II? 26/08/2012 - KESSLER vs ABRAHAM? 15/06/2012 - CAN LEE GET FAIR SHAKE IN TEXAS? 26/05/2012 - THE BIG QUESTION: CAN FROCH TAME BUTE? 16/04/2012 - BRANDON RIOS vs JUAN MANUEL MARQUEZ NEXT? 09/02/2012 - MICHAEL OLIVEIRA MAY BE NEW "ROAD WARRIOR"
24/01/2012 - AIBA: CAN ANYONE STOP THE UKRAINE? 16/01/2012 - MAGEE vs MARKUSSEN, ON OR OFF? 15/01/2012 - ALI TRAINER DUNDEE: MUHAMMAD . . .
15/01/2012 - HERE COMES SNOOKI ... THE PROMOTER? 25/12/2011 - LEE BENNETT IS BACK ON TRACK! 22/12/2011 - HELENIUS vs DIMITRENKO ON AGAIN? 24/11/2011 - KLITSCHKOS: IS THERE ANYONE ELSE OUT THERE? 15/09/2011 - GATTI'S WIDOW SAYS . . .
30/08/2011 - BOXING CHAMP VICTOR ORTIZ BECOMES . . .
06/07/2011 - POVETKIN VS CHAGAEV?